The vast majority of Fire Captain Interviews will include a question about conflict at work. Below is an example from a recent Fire Captain interview from a department in Texas sent to us by James. Conflict resolution is a valuable skill for Fire Captains. This question and sample answer have been added to our Fire Officer Interview Book which you can purchase from the link. Give us an example of a time you had to deal with a personnel conflict at work. How did you handle the situation and were you satisfied with the outcome. Key Talking Points: First of all be sure to have an example prepared for this questions. If you decide to answer with something like “I get along with everyone and really don’t have any personnel conflicts . . .” the panel will probably think you’re not being completely truthful. Everyone has some type of conflict they have dealt with. It is acceptable to explain that some minor conflicts are not worth addressing, while others will obviously grow into larger problems. As you think back on a conflict be sure to pick one in which you approached the issue correctly, trying to solve the problem at the lowest level possible. Sample Answer: Several years ago as a younger firefighter I had a conflict with the paramedic on my unit. While we were on emergency scenes he was speaking to me in an unprofessional and inappropriate manner in front of patients and their families. I was the youngest member of the crew and the first couple of times he did this I did not say anything. As it continued I realized it was not an isolated event, or a result of him just having a bad day. So I addressed the issue by pulling him aside after a call and telling him that his tone and comments were not appropriate. I explained that he was not just making us look bad, he was making our entire department look bad. My medic explained that he was very passionate about medicine and was “barking” at me because of his passion and desire to perform well. As we talked we both found common ground and even decided to modify how we worked together on medical calls. It led to both of us becoming more productive, gaining respect for each other, and performing better. I was satisfied with the outcome however if I had the opportunity to “do it over” I would address the issue immediately rather than chalking it up to him having a bad day. It was a great learning experience for me as a young firefighter. I was pleased we could handle the issue ourselves without involving anyone else. I would like to add that as a Captain this is exactly the type of situation I would be on top of immediately. Some situations and conflicts aren’t a big deal and can be ignored, for example finger popping. Others such as this example must be addressed immediately. You can find this question and over 80 more in our Fire Officer Interview ebook which is available as an instant download below. This book has helped hundreds of candidates get promoted to Fire Captain and Fire Lieutenant over the last few years. We are confident it can help you too. The fire officer Interview is so competitive candidates should try to gain any advantage that they can. The difference between getting promoted and having to test again the following year could be one single interview question. Here are a few tips for your Fire Captain Interview. Be Prepared: First and foremost you must be knowledgeable and well versed in all aspects of the Fire Captain interview. You should know all of your department’s policies and SOPs. The easiest and most thorough way to prepare for the interview questions is to use our Fire Officer Interview Book. It contains over 80 questions from Fire Officer Interviews around the country. It essentially gives you the questions to study prior to your interview. Be Passionate: It’s not always about which candidate can most eloquently answer each question. Interview panels want to see the passion and the fire behind the words in those answers. Be sure to demonstrate this passion in all of your questions. Make sure the panel knows how badly you want this position. Show long term dedication: As strong as the competition is for these positions, many times very good candidates are just not promoted. The biggest mistake they can make is to become disenchanted and stop testing, or worse adopt a negative attitude and resent the administration for not being promoted. Instead if the opportunity arises during your interview be sure to tell the panel that THIS position is your goal and you will stop at nothing to get it. If you’re not promoted this time, you will test again, score high again, and see them again in another interview. This will absolutely leave a lasting impression on the interview panel. Finish Strong: Your closing statement is your opportunity to sell yourself and leave a final positive impression on the panel. Use this opportunity to once again highlight your greatest strengths and then to passionately state how much you want this position, and that you will thrive and succeed once promoted. Be sure to look at our Fire Officer Interview book if you want to study over 80 actual interview questions from around the country. One of the most difficult parts of a Fire Officer Interview are the scenario questions. The candidate has to listen to the scenario, reference SOP/SOGs and formulate a strategy and tactics to effectively mitigate the emergency. Proper size up and accounting for scene safety is critical. Here is a scenario that was given to Fire Captain candidates in California recently. Scenario: You are called to a smell of gas at a duplex at 1am. The response consists of three engines, one ladder truck, and a heavy rescue unit. You arrive on scene and take command. The resident states she can smell something funny in her unit and things it may be gas. She states that she doesn’t know if her neighbor is home. Example Answer: This is a very typical call in the fire service. As command the first thing I want to do is ensure the arriving apparatus are positioned correctly. I will instruct my engineer to position our engine two houses down past the address, following our SOP on natural gas leaks inside a residence. I will also instruct my second due pumper to stand by at the hydrant, and the third due company to stage in an appropriate staging area, and prepare to be a RIT team. I want the ladder truck to stage two houses short of the address, and the rescue to stage in the staging area. I will send my medic and firefighter into the unit with full PPE and a gas detector. I will have the rescue crew evacuate the other unit of the duplex and use a gas detector to check it. If any gas is detected we will immediately shut off the gas supply to the home and lock out the meter. I will notify the gas company, and my battalion chief of a locked out meter. We will then ventilate all affected units either naturally or with PPV depending on how much gas we detected. Once the hazard has been removed I will clear the additional units from the scene. I will also work with the citizen to ensure they have family they can stay with for the night, or a place to go. Our Fire Department Chaplin has the ability to get hotel rooms for displaced families if necessary. 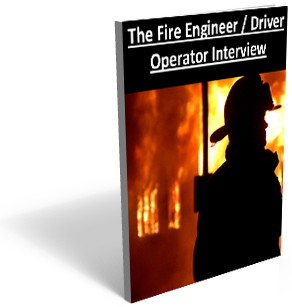 This question has been added to our Fire Officer Interview ebook. We have updated this question a little since our last post with some new ideas. Progressive discipline is a question asked in nearly every Fire Officer Interview. It is a crucial component of an officers responsibilities. 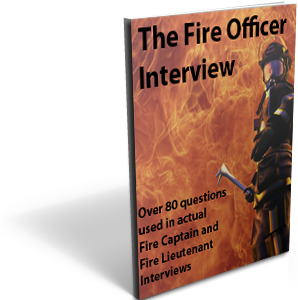 We have added a new question to our Fire Officer Interview Questions Ebook. This question comes from David in California who just completed his Fire Captain Interview. David wrote, “Thanks for all your help Jason, some of our email conversations were very helpful. I wanted to let you know about a question that you can address in your book. I had 12 questions that they asked in my interview and 11 of them were covered in the fire officer ebook. Thanks again.” Here is the new addition to our fire officer interview ebook. Describe our department’s progressive discipline policy. Key Points: You want to answer this question by walking through your department’s disciplinary process from the first step, up to termination. Talk about the officer’s role in each step. Also speak to how you will support decisions that are made at higher ranks regarding the discipline of a subordinate. Example Answer: Our department’s progressive discipline policy begins with a verbal warning. This takes place between the officer and his subordinate. The officer should explain the situation, lay out a plan for improvement, and hopefully resolve the issue at that step. The next step is a verbal reprimand, which must also be documented by the officer. The officer is also responsible for notifying the Battalion Chief of the incident. The next step is a written warning. This is done by the officer and Battalion Chief, and presented to the subordinate at a meeting. At this meeting they lay out an improvement plan, and discuss the future steps of discipline if no improvement is made. The next step is docking pay. This is done at our Battalion Chief level. As an officer, my job will be to continue documenting events, and provide support to the Battalion Chief. The final step is termination. The goal of discipline is not to punish, but rather to improve performance. Depending on the severity of the offense, discipline can begin at any level of process. We recently sat in on a Fire Captain Oral Board Interview for another department. One of the candidates gave a fantastic answer to this challenging question. His answer really impressed his Chief. There are two meanings to discipline in the fire service. The first is using discipline as a tool to improve the performance of an individual. Our progressive discipline procedure has this as its primary goal. It ranges from a verbal warning, up to termination. The goal of every step before termination is to improve the performance of an employee. Each step has performance improvement steps and measures. The second meaning of discipline can be viewed in terms of a disciplined crew. As a newly promoted company officer, I plan on running a disciplined firehouse and crew. To me this means a crew that self starts on tasks, follows all procedures and rules, and is “on the ball”. We will train daily with the goal of being the best that we can be. A disciplined crew is highly efficient and effective. This is a fantastic answer. Remember, discipline is not a punishment; it is a tool to improve performance. When answering this question, you also may want to discuss your role in the disciplinary process. We have added this question to our Fire Officer Interview Questions guide. The Fire Officer Promotional Interview is an extremely challenging event in a firefighter’s career. It is a highly desirable position that can affect a persons income over the course of their career and into retirement. The competition is fierce with candidates that have great education, training, and experience. Our Fire Officer Interview book is designed to give you an edge in this competition. We can help you craft insightful and meaningful answers that will wow the panel. Our book contains interview questions from around the country that have been used in actual fire captain and fire lieutenant promotional interviews. We have conducted countless interviews and provide great insight into the right and wrong way to answer these questions. Below is a sample from our book. Please describe your view of discipline. Key Points: Remember, discipline is not a punishment; it is a tool to improve performance. You also may want to discuss your role in the disciplinary process. Some candidates may also talk about discipline in terms of everyday behavior in accordance with rules and regulations. Example Answer: There are two meanings to discipline in the fire service. The first is using discipline as a tool to improve the performance of an individual. Our progressive discipline procedure has this as its primary goal. It ranges from a verbal warning, up to termination. The goal of every step before termination is to improve the performance of an employee. Each step has performance improvement steps and measures. I recently conducted a Fire Captain Interview at a neighboring department. We interviewed 9 candidates to fill 3 openings. All 9 of the candidates were very qualified, well prepared, and had similar backgrounds in the fire service. While each had areas where they really shined, it was very difficult to pick the top three. One specific question became the “decision maker” of the interview and decided who got promoted and who would try again next year. It is always amazing to think about how close and how competitive these interviews are. Candidates spend years training, seeking out education, and preparing for a promotion; and it all comes down to one question. Below is the specific question that really made the decision for the panel. There is nothing special about this question, but rather the quality of their answers. Each candidate answered it satisfactorily however some went above and beyond. This question has been added to our Fire Officer Interview book, along with over 80 others. Below is the question and a paraphrased version of how one candidate answered it. If you are not selected for this promotion how will you react? What are your future plans at this department? Sir if I am not selected for this position I will feel like I have not achieved the goal that I set shortly after getting hired. My reaction will be a hardened resolve. I will begin studying for the next test immediately and continue seeking out every education and training opportunity that I can get my hands on. As you can see from my resume and training docket, I have attended many classes outside of our department and brought some great information back. None of that will change, I will continue to be a leader from my position as an Engineer and continue working to be a Captain. If I am not chosen my future plans will be to come out number one on the next test and get promoted then. Follow up Question: What if you are not selected in the next round of promotions? Sir I do not want to sound arrogant or cocky so please don’t misunderstand what I am trying to say. If I am not selected this time I will become even more motivated in my preparation. By next year’s promotions I will have more training, a completed bachelor’s degree, and even more time filling in as Captain. I believe after you see my performance, attitude and new qualifications over the year’s time that you will very much want me in a Captain’s position. If I am wrong, and I am not selected again, you can plan on seeing me again the following year in the number one spot. Wow did that candidate take a risk with his answer to the follow up question! The reason it worked was his delivery. He looked the Chief straight in the eye and answered very respectfully and confidently. He spoke with such genuine desire and heart that I had no doubt in my mind he would continue scoring number one on the test until he was promoted. If his answer was delivered in any other manner it would have come off cocky, arrogant, and annoying. His risk was rewarded and he by far had the best answer to the question. This question and over 80 others are in our Fire Officer Interview Book. It is full of insightful answers like this one for fire captain and fire lieutenant interviews. After a long road of studying and then passing the written exam, it will finally be time for the Fire Officer Oral Board. Most candidates will begin looking for books or searching the internet for Fire Officer oral board questions or fire officer interview questions. There are some generic questions on forums and chat rooms, but you probably already know what those are. If you really want to succeed in your interview you need to be studying the difficult questions. You need to be ready for the questions that will catch the other candidates off guard. The best way to prepare for that is with our fire officer interview book. It consists of over 80 high quality interview questions that were used in real interviews. We have compiled these questions from oral board members, retired chiefs, and interviewees. 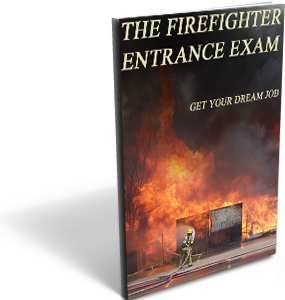 It is the most comprehensive and complete fire officer interview preparation that exists. 23. Describe our department’s progressive discipline policy. Example Answer: Our department’s progressive discipline policy begins with a verbal warning. This takes place between the officer and his subordinate. The officer should explain the situation, lay out a plan for improvement, and hopefully resolve the issue at that step. The next step is a verbal reprimand, which must also be documented by the officer. The officer is also responsible for notifying the Battalion Chief of the incident. The next step is a written warning and a written performance improvement plan. This is done by the officer and Battalion Chief, and presented to the subordinate at a meeting. At this meeting they lay out an improvement plan, and discuss the future steps of discipline if no improvement is made. This is where all expectations must be crystal clear and proper time frames set. The next step is docking pay. This is done at our Battalion Chief level. As an officer, my job will be to continue documenting events, and provide support to the Battalion Chief. The final step is termination. The goal of discipline is not to punish, but rather to improve performance. Depending on the severity of the offense, discipline can begin at any level of process. You can follow the link below to purchase our book through paypal and download instantly to any device. Here is a new fire officer promotional interview question and answer that was sent to us by a customer who purchased our book and successfully went through an interview. The question is common in both fire captain and fire lieutenant interviews and has been added to our Fire Officer Interview Book. There are several ways to correctly answer it depending on each department’s procedures, however stressing your commitment to ongoing training and education will always help your cause. How do you plan on improving the level of training and education in our department? Training and education are vital to continual improvement. I have constantly worked to improve my level of training and education. I hold a bachelor’s degree in chemistry with an associate’s degree in fire science. I recently began taking classes for a master’s degree in public administration. As you can see from my training summary, I have pursued every available training opportunity since I was hired. I have traveled to other departments to listen to guest speakers and taken national fire academy weekend courses on leadership and decision making skills. My goal is to be the best Lieutenant on this job, and to accomplish that I will continue doing what I have been doing, seeking out every available training opportunity there is. I have brought some of these new ideas back to our department. Recently I gave a class that was based on a propane emergencies class that I attended. There were a few things that I learned that I passed onto our firefighters. I will continue to bring outside perspectives and ideas into our department this way.